For almost a year, I was a complete classpass whore. I joined during the first wave when it was only $100 a month and you can go to your favorite gyms as many times as you want. It was heaven, especially because I was in #shreddingforthewedding mode. However, after a few months, I noticed the classes became fuller, the monthly price slowly began to rise, and then got hit with the “3x a month” gym visit. Annoying yes, but did the price/restrictions outweigh other gym memberships? No. I bit my tongue and continued on. One day, after getting locked out of one of my usual classes, I noticed a class nearby at Lateral Fitness called “TACFIT.” Since I had nothing to lose and needed to fill my morning with a workout, I signed up. Little did I know this was the class to change everything going forward. Going into the class, I had no expectations. All I knew was that it was going to be HIIT style moves. However, instead of getting a typical cross-fit loving-beefcake instructor, I was met by someone who was extremely personable and polite. 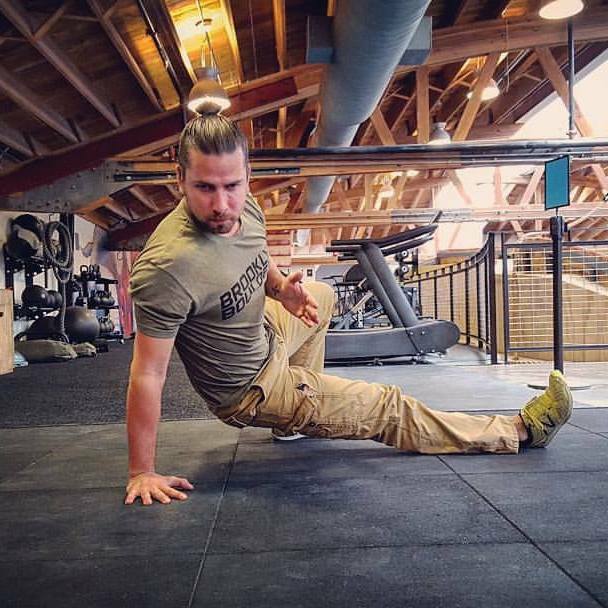 David Hardin conducts TACFIT classes (and at Brooklyn Boulders) in order to help students focus on mobility and whole body health, while still doing a hard workout. Instead of doing the typical HIIT and cross-fit bologna, the moves in TACFIT focus on restoring joint function in reality-based, practical movement. A.K.A. the way your body was designed to move without pain. I will admit, first learning the moves and workouts was really strange. I’m used to do “American” style versions (not proper form) of movements. However, from day one until my workout this morning, David has always been hands on. He is always correcting form (in a nice tone), helping improve body mobility, being cognizant of body situations (injury, pregnant, sick, etc. ), and making us stronger. 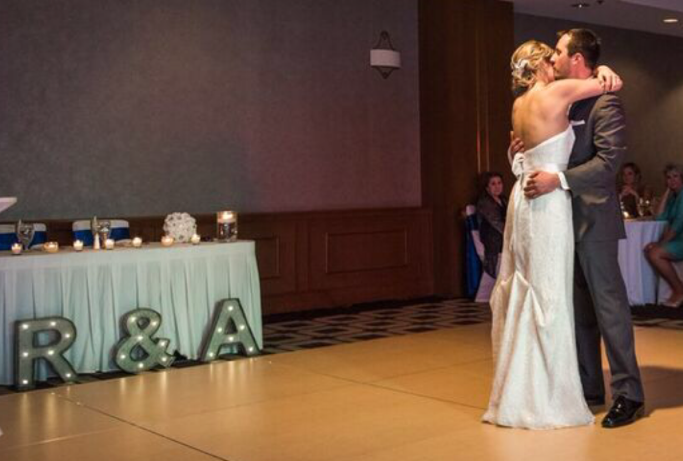 Before my wedding, a goal of mine was to have those arms every bride craves. Within three weeks of (2x a week) TACFIT workouts, my arms and back were shredded. I didn’t even notice how girly-shredded I was until I saw this picture from my wedding (see below). When did you begin to take interest/get involved with TACFIT? Why? DH: I was first introduced to TACFIT by my friend and mentor, Sonie Lasker. When she and I first met, we shared a different view of health and fitness than the rest of the world; a more health first approach. She quickly pointed out that there were others out there like us, and quickly introduced me (online) to Scott Sonnon, founder of TACFIT. How long did it take you from start to finish to become a certified TACFIT instructor? DH: I spent about three years studying and practicing on my own, closely following Coach Sonnon’s videos and online instruction. This was my best option at the time, as there were no TACFIT professionals here in Chicago. I then made my way out to the West Coast for a 4-day training seminar to gain my first level certification. What is the most rewarding part of being involved in the health industry? DH: Truly being able to positively impact and help change someone’s life. Having clients come to me after years of aches and pains and dozens of doctor visits – to tell me that they’ve never felt so good is extremely rewarding. What is your daily/weekly routine like? DH: When it comes to my daily workouts, I subscribe to TACFIT’s 4-day wave, which is a four day cycle that ensures the best results without burning out or causing injury. The four day wave starts with a no-intensity day, where I focus on mainly mobility to help restore my natural range of motion. This will help reduce tensions throughout my body and help “clean the slate.” Day 2 is a light intensity day and is usually the day I do more yoga work. Adding a bit of stress to the body, but still helping it open up and reduce tension. Day 3 is a moderate intensity day, and what we call the “practice day.” This workout will be performed between 60-80% of MHR and gives the brain the opportunity to understand the movements, helping to strengthen neuromuscular connections. Day 4 is our high intensity day where you do the same workout as Day 3, but this time you hit it hard. The brain says “oh, I remember this workout” which allows you to perform at a higher level with proper form. As for nutrition, I love to experiment with many different nutrition programs. I do not recommend anything to my clients unless I have first tried it myself. Currently, I am on a 4-day wave nutrition program that compliments the workout program. But, two of my most recent programs (and favorites) are the Ketogenic Diet and Slow Carb Diet. DH: This is a tough question to answer, as I am well known for my epic cheat days. I can’t help it, I love junk food. Which is why I regularly schedule cheat days to allow a little bit of a release. My top cheat foods are pizza, kit kat bars, Reese’s peanut butter cups, fritos, or cheetos. If someone can’t afford to take a class or become certified, what is the most valuable exercise(s) to increase mobility? DH: First, we have plenty of free programs and resources online. Just google TACFIT and you’ll find your way. I would say the best place to start, which is the simplest, would be out Intu-Flow program. Anyone can do it. and if it’s done everyday, major results will occur with minimal effort.